(Life Defenders) Growing up I lived in a true to form Christian conservative home. Abortion was never really mentioned but was more-so implied in church life. I never really felt “at home” at home with my mother and step-father, and at the age of 13 after freshman year of high school, I moved to Colorado to live with my biological father. My life went from strict rules to no rules, surrounded by an incredibly new-age, do what feels right lifestyle. I became somewhat promiscuous, though no more than your stereotypical teenager. Not long after turning 16, my then boyfriend and I found ourselves pregnant. I had no idea how to address this at home, and that night blurted out to my dad, “I’m pregnant.” I wish I could tell you there was some long, meaningful discussion afterward where real options and choices were addressed, but that is only my fantasy of what could have happened. Instead, it was decided for me (I stated I wished to keep my child, and then, when that was declined, put that child up for adoption) that I would have an abortion immediately, or I would be finding myself homeless. During my ultrasound at Planned Parenthood to determine that I was pregnant and how far along I was, I was not allowed to see the image on the monitor. “You won’t be able to see anything,” the woman casually mentioned. One week later I found myself outside of the Planned Parenthood where my abortion was to take place, with my oh-so-caring father. An older man, all by himself, stood outside with a simple photo of Jesus and told me, “You have a choice.” I felt myself screaming inside for him to grab me and take me away, but instead, I huddled behind my dad as he [dad] proclaimed, “You (meaning me) always have a choice,” as he walked me into the building. As we entered and slid the money to a woman behind thick glass, we were told there would be no refund even if I changed my mind. After sitting I began filling out the paperwork, and in the section where it asked why I was having an abortion, I could only write, “I want to keep my baby.” It was shortly understood that was never read, or no one cared. My “pre-abortion counseling” took place in a little side bathroom/office room, and the woman just asked if I wanted the surgical abortion or the abortion pill. Scared of this continuing any further, I chose to have a surgical suction abortion. After I was put into my gown and my legs in the holders, a new nurse came in with three male college students and asked if it was alright for them to watch. I awkwardly said, “ya,” before feeling the worst pain I could describe and passed out. After the procedure and feeling like a cow in a herd where no one really knew or cared about you individually, I was helped into the recovery room. I only remember two girls in there, roughly my age. One was sobbing quietly as the girl next to her casually stated how she had asked to see the POC (products of conception) and how she saw a foot. I don’t remember ever making a sound. After my hour “rest” I was sent on my way with one-month free birth control. It should come as no surprise that after weeks of severe depression and not leaving my room, my boyfriend and I broke up. After the abortion I became a devout, proud post-abortive woman who had no problems bragging about my choice, not realizing just how much I was allowing myself to bury the pain. What better way than to create a record in your mind on how this is a woman’s choice and of course I could never have become successful had I not had the abortion. I slept with a new person every week and had no issue accepting any drug that was handed to me. In 2010, I met a man who would change everything. I, a proud pro-choice liberal and hater of everyone and everything religious, and he, a proud pro-life, God-fearing traditional Roman Catholic. It was the strangest romance you could imagine. Eight months into dating (and everyone in our lives not wanting us to be together) we found ourselves pregnant. At eight weeks along I had my first ultrasound appointment. I thought back to the woman who said I would see nothing, (I was around 8-9 weeks along when I had my abortion) so in my mind, this was practically a pointless thing to do. But as my OB turned the TV to face me, my world collapsed. There I was, 19 years old, staring at the smallest human I’d ever seen. 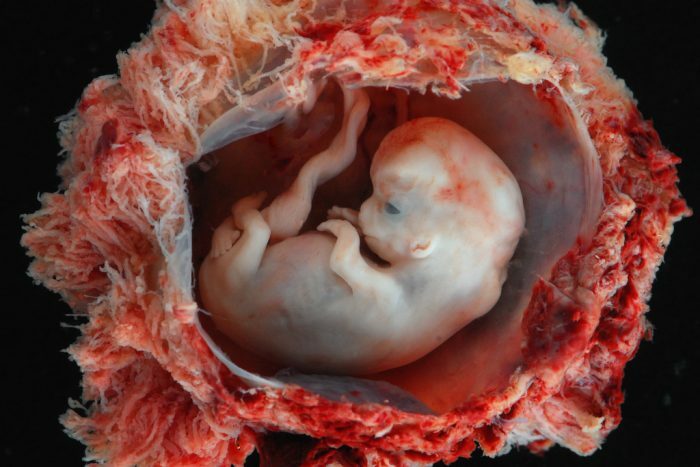 A small oval body, a head with no neck, little clear nubs of hands and feet, and right in the center, a loud, bright, healthy heartbeat pounding away. I tried harder than anything to become even more pro-choice. To accept that I had fallen for this lie, and worse, participated in the destruction of a completely innocent human being, was not something I could accept. Yet, there was no denying what I had seen. Over the next few months, I struggled with depression and suicidal thoughts, and I remain thankful for a man who loved and accepted me through my changes, and the child growing inside me keeping me there even while I felt like I had failed her for taking away her sibling. 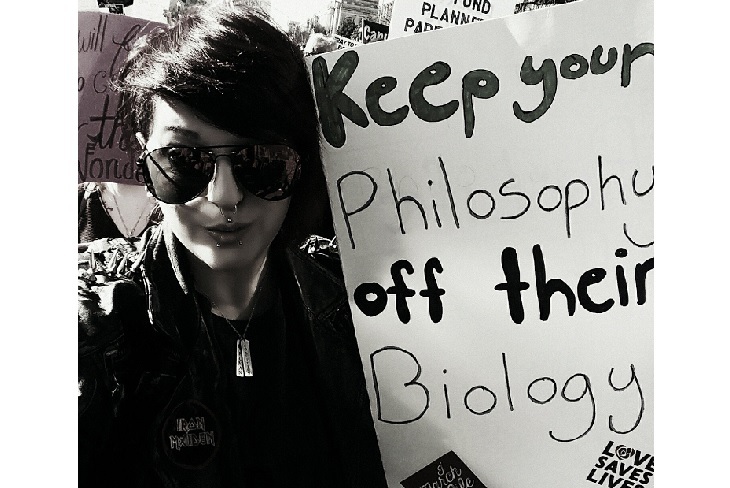 In 2013 I went back to Planned Parenthood to reclaim my abortion records. I needed to hold those papers, and in my heart, it felt like that last bit of healing. I was able to retrieve them without issue, and as I sat in my car looking through the files, I came across photocopies of my ultrasound. There are no just words to express the sorrow that swept over me in that moment. To see the child who I had deemed my son, Tucker, in a photo for the first and only time in my life was healing and earth-shattering all at once. Years later now, I am married to that same compassionate man and we have four beautiful children. I have devoted my life to speaking out with love and guidance, sharing my story and helping young girls during and after their pregnancies, and many after abortions. I have helped women reclaim their abortion records, and sat up countless nights hearing their stories of regret, loss, and paths of healing. My son never got the life he deserved to live, but I thank you all for hearing me and allowing me to give him the honor he deserves for helping me on this path in life. To hold on to that silver lining where we all may go forth and help others who are in need just as I was. Editor’s Note: This article originally appeared at Life Defenders on May 10, 2018, and is reprinted here with permission.